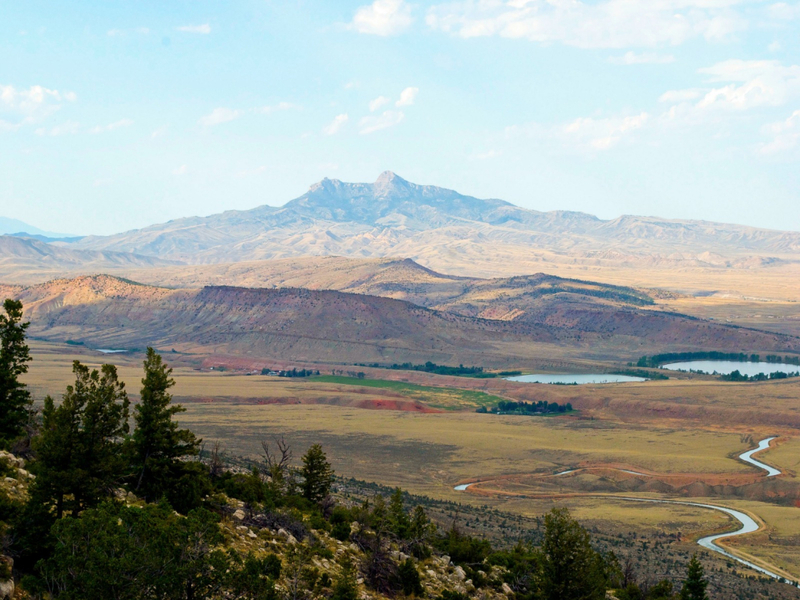 Heart Mountain itself dominates the north end of the Big Horn Basin. It towers 8,123' above the floor of the Basin, a landmark in a sea of flat. Geologists have long been fascinated by Heart Mountain because the rocks at the top of the peak are 300 million years older than those on the floor of the Basin. The unique geology of Heart Mountain creates some distinctive features and most of the mountain has come under the protection of the Nature Conservancy. There are several species of rare plants on the preserve, plus it serves as vital habitat for birds and other wildlife. This trail is uphill to the top, with some sections more steep than others. You’ll start out in the sagebrush community, travel through some grassy areas and through the pines until you reach the summit. Lots of water and time make this a really nice hike. The varying landscape really keeps your attention as you slog to the summit. Watch for ground nesters in the sagebrush, including quail and grouse, lark buntings and Wyoming’s state bird, the Western Meadowlark. If you go before late July you should see some incredible wildflower displays. Watch for the changing species as you ascend in elevation. Once you reach the top you’ll feel like an eagle as you survey the vastness of the land below you. The views are amazing, but if the afternoon thunderstorms roll in don’t linger on the exposed summit. The trail is most comfortable with sturdy shoes. It’s well-marked and you can sign the register at the top. Although there are locals who hike the mountain every week for a fun, fast workout, Heart Mountain is the perfect trail for a leisurely hike. This makes a great half day hike, either early in the morning or waiting until the evening to head out. Watching the full moon rise over the expanse of the Basin is spectacular and if you’re a city dweller, you’ve probably never seen stars like those from the summit. A headlamp makes the trip back down less stressful. The beginning of the trail can be hot and dry during mid-summer, so it’s best not to attempt it during the heat of the day. Bring along a wildflower identification guide - you just might see one of the many rare plants that make their home on the mountain. You also might want to bring a state map with you so you can orient to the landscape from the top. 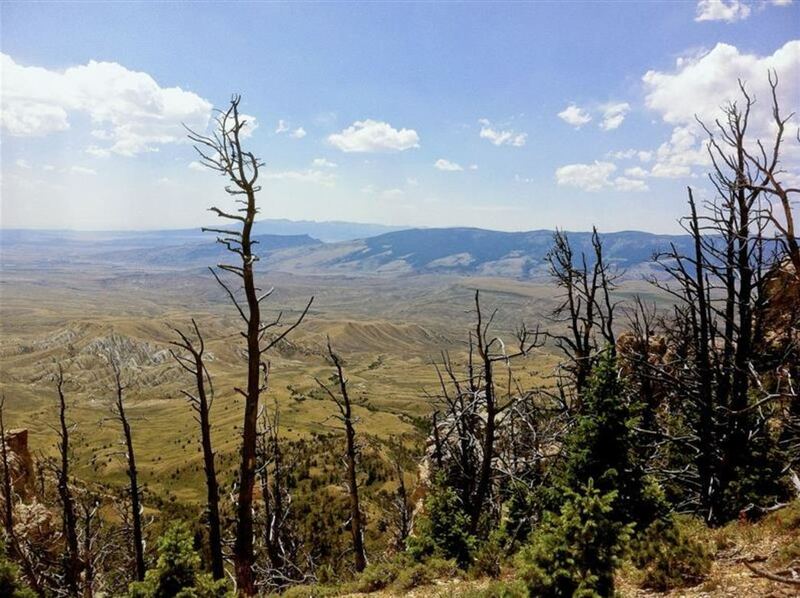 If you like huge vistas, this is the hike for you. Plus you can refresh and refuel in either Cody or Powell after the hike. From Cody take US Hwy 14 towards Powell. At 13.1 miles turn left (west) onto County Road 19. This is also the turnoff for the Heart Mountain Interpretive Center, which is well worth your time to visit. It is a memorial to the Japanese citizens who were interned there during World War II. Continue on Road 19, which eventually makes a hard left and becomes Lane 13H. The pavement ends at 15.7 miles and the Preserve office is at 18.0 miles. At 20.5 miles bear left at the fork. The trailhead is at 21.5 miles. There are no fees but please register at the Heart Mountain Preserve office. There is a vault toilet at the trailhead, but camping is not allowed and dogs are not permitted at all. There have been grizzly bears seen on the mountain as well as black bears, so bring your bear spray.